So you’ve rushed back from Tesco, thrown your Innocent Bombay Curry in the fridge, and collapsed on the sofa for a relaxing evening watching The Inbetweeners. Halfway through, something catches your eye. One of your beers didn’t make it into the fridge; it is now room temperature, not exactly the refreshing accompaniment to your meal that you had hoped for. Of course, you could add it to your impressive collection, waiting four hours until it is perfectly frosty and ready to drink. 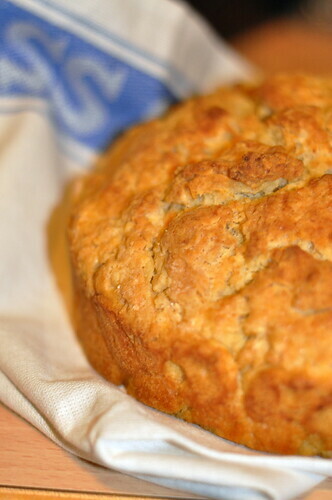 Or you could whip up a loaf of beer bread. In under an hour. Now why hadn’t you thought of this before? 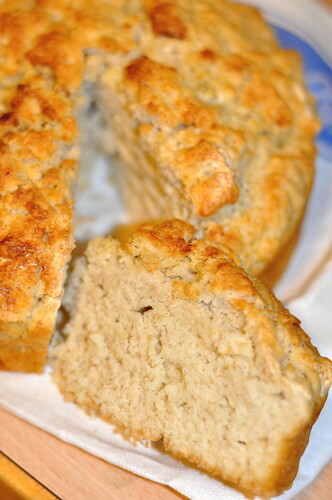 Beer bread is a simple quick bread that takes minimal time and even less effort to make. Unlike a traditional French baguette or loaf of rye bread, beer bread is not leavened with yeast. 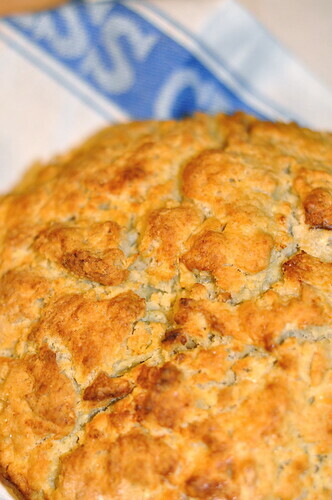 Beer bread and other quick breads employ baking powder to help them rise. The yeast in the beer provides an additional lift, making beer bread light and airy and just what you want to mop up the last drops of lentil soup in your bowl. The sugar in beer bread is a wonderful contrast to the malt-y flavor of the beer, and only enhances the golden crispiness of the butter-drizzled crust. It is a very adaptable recipe and can be made in any shape, from a simple loaf to a round cake-like version to mini muffins so enticing no one will be able to resist sneaking one while the table is being set. Do you want to know the best part about it? You do not need a Grande Diplome from Le Cordon Bleu to make it. If you can turn on the oven, then you are less than 45 minutes away from the best thing since, well, sliced bread. Slather it with salted butter at dinner, or dollop it with jam and clotted cream at tea. Either way, you are in for a treat. Preheat oven to 190 degrees celcius or 375 degrees farenheit. 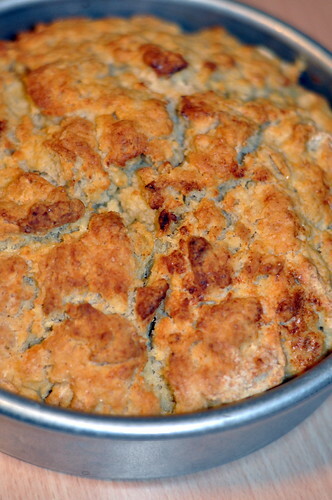 Grease a 9-by-5-inch loaf pan. In a bowl, stir together the flour, brown sugar, baking powder, and salt. Open the beer and add it all at once; it will foam up. Stir briskly just until combined, about 20 strokes. The batter should be slightly lumpy. Pour into the prepared loaf pan and drizzle with the melted butter. 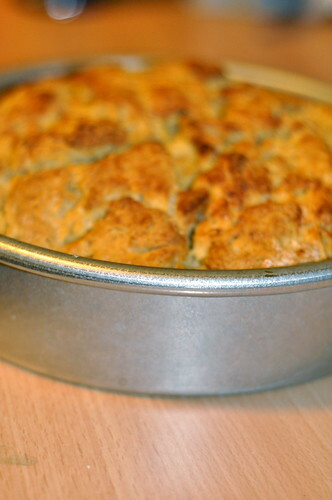 Bake until the top is crusty and a cake tester inserted into the center comes out clean, 35-40 minutes. Let rest in the pan for 5 minutes, then turn the loaf out onto a rack. Serve warm or at room temperature the day it is made. Cut into thick slices and accompany with plenty of butter. we have this "recipe" in our family. i am glad you wrote it out, cuz it is a touchy feel recipe. we do ours in loaves and serve with with ribs. it came to our family when some people went to live in nashville. and when they came back, they was mak'in this bread. fyi -- our family "recipe" is made with cake flour if you want to try that variation sometime.